THE HANG-TEN HANGMEN are a high energy, guitar instrumental rock n roll band from Vancouver BC. Their matching guitars, outfits and masks make them easy to see, their crowd interactive shows and incredible sounds make them amazing to hear! 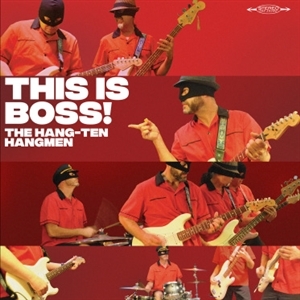 This is Boss is THE HANG-TEN HANGMENs first ever full length, all original vinyl release. Eleven brand new songs that rock and groove like nothing theyve ever done before! With tracks ranging from the LINK WRAY inspired title track to the 60s Spaghetti Western feel of The Wind and the Sea" and some seriously potent tracks in between this is easily the best thing to come out of their camp since they first donned their notorious black masks.